Kapamilya Fiesta World Japan with the cast of "FPJ's Ang Probinsyano"
CHIBA, Japan - Feb. 27, 2019 - PRLog -- The cast of the ABS-CBN series "FPJ's Ang Probinsyano" is ready to greet everyone kon'nichiwa as ABS-CBN Regional Group and The Filipino Channel (TFC) fly them to Japan for the "Kapamilya Fiesta World Japan" happening on April 21 at the Ichikawa City Cultural Hall in Chiba Prefecture. As festivities kick-off in April, Coco Martin, Yassi Pressman, John Prats, Smugglaz, Bassilyo, Empoy, and Pooh will bring a Filipino-themed fiesta in Japan that is filled with color and entertainment. Everyone will surely be hyped up and laughing their hearts out with comedian Pooh hosting the event. Smugglaz and Bassilyo with bring the house down with some beats that made them popular even before crossing-over to acting. While Empoy returns to Japan more than a year after the success of his film "Kita Kita", that was shot in the scenic city of Sapporo in Hokkaido. Show-stopping dance numbers can be expected from the Philippines' Dancefloor Princess Yassi Pressman and Dancefloor Dynamite John Prats. Lastly, serenading and swooning the crowd is none other than Prince of Philippine TV Series Coco Martin. 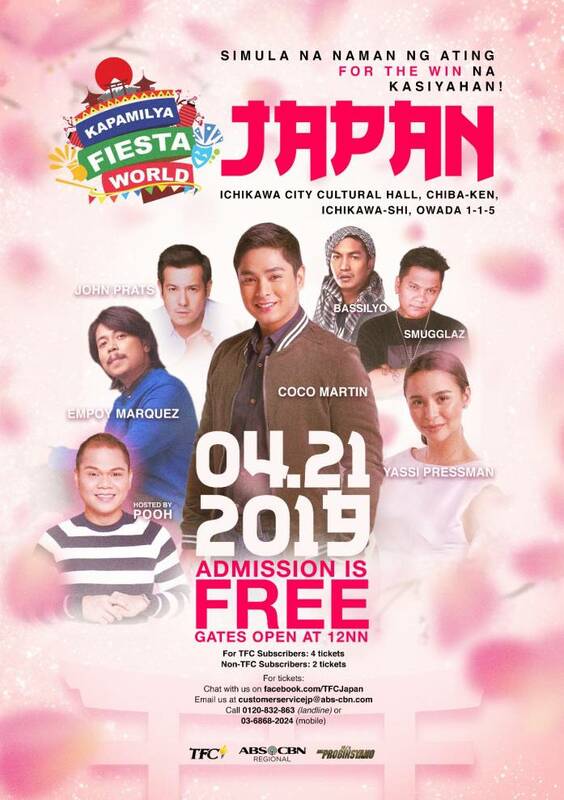 Gear up for a fun-filled afternoon with the cast of ABS-CBN's top-rating series, "FPJ's Ang Probinsyano" at the "Kapamilya Fiesta World Japan" on April 21 at the Ichikawa City Cultural Hall in Chiba Prefecture. Everyone is invited to watch this FREE event! While there is an exclusive promo for TFC subscribers who want to be part of the event. To know more and for the terms and conditions of the promo, you can contact TFC's customer service representatives via chat on facebook.com/TFCJapan, by sending an email to customerservicejp@abs-cbn.com, or by calling 0120-832-863 (landline) or 03-6868-2024 (mobile). The promo is for a limited time only, until supplies last. Promo period is from February 1 to April 20, 2019. For more details about the event, visit and like facebook.com/TFCJapan.